This elegant antique wedding band is fashioned of platinum and adorned with an intricate ribbon of abstract flowers. 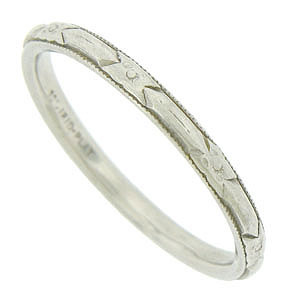 The edges of the Art Deco wedding ring are finished with a delicate scalloped engraving. The ring measures 1.90 mm in width. Circa: 1920. Size 5 1/2. We cannot re-size.